Learn the secret for drying hydrangeas that will last for a long time. They will look great in wreaths, and vignettes all over your home. 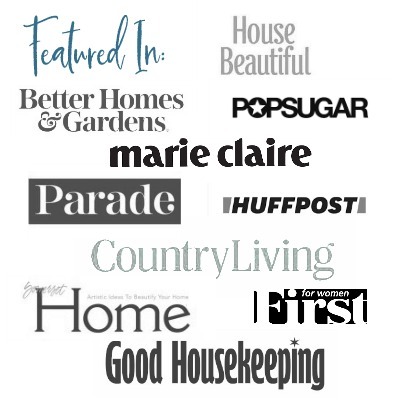 Are you growing hydrangeas? 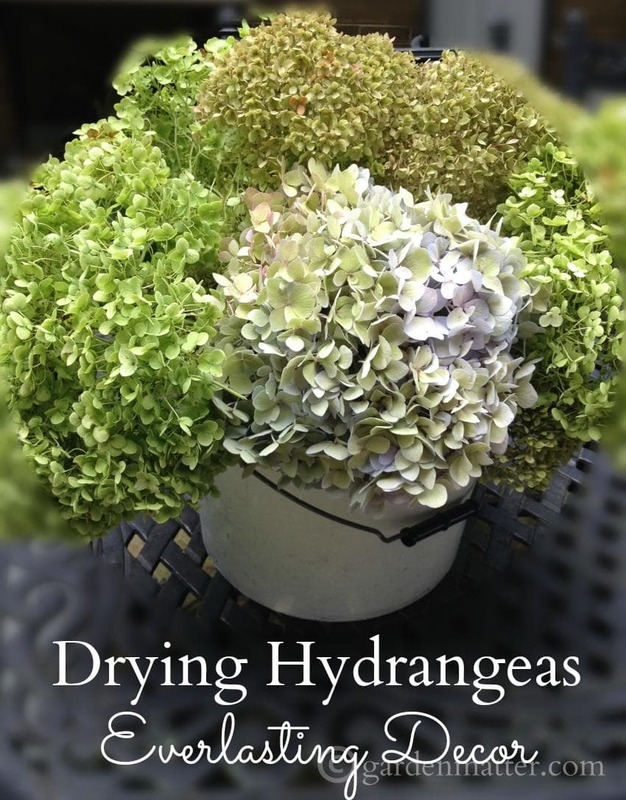 If so, you will definitely love drying hydrangeas to save in a vase, or use in a wreath. The process is really very easy. Timing is the issue in this simple craft. Along with time comes patience, and I can relate with having a problem when it comes to patience. I think most people would agree that hydrangeas are almost as beautiful dried as they are fresh. They keep quite a long time once dried, as an everlasting bouquet, in wreaths and many other decorative projects. You need to wait to cut them late in the season, when they are starting to dry on the shrub. These flowers are all getting ready to be cut for drying. They start to get a washed out antique look. Some even feel dry to the touch. All you need to do is take off all the leaves, and place them in a bucket or vase with a little bit of water (one or two inches). After about a week or two, the water will evaporate and the flowers will dry in place. Pretty simple, huh? This process works well with mophead hydrangeas and other varieties such as H. arborescens and H. paniculata. I have dried hydrangeas all over the place in my home. I’ve used them in centerpieces at the holidays, in wreaths, and some in vases. After a while they can get a little fragile and dusty, but did you know that you can dunk them in water to make them more pliable for use in a project. See my post on creating a square hydrangea wreath where I used older dried hydrangeas. While they seem fragile they actually last a long time. Drying hydrangeas is a great idea if you are growing them outside already. What not give it a try? Great ideas !!!!! Excited about this site !!!! I’m so glad and hope you stop back often. I am new to the group and looking forward to everything you post. I have two beautiful Hydrangea bushes in my back yard. I have enjoyed drying flowers for decades. I especially enjoy Roses and Hydrangeas. My method of drying most flowers is to hang them up side down. Yes, it looks strange-walk into my condo and you’ll even see them hanging in the kitchen from the knobs of the cabinets. Pretty; but, strange. Yes, I’m known to be a bit eclectic. The Roses I like to dry by the bunch. I tie twine around the stems of the bunch(sometimes I take the leaves off and sometimes I leave them on) and just hang them upside down. By doing that, the stems also dry beautifully and straight. I also dry Baby’s Breath in with the bunch. At times I dry single Roses from special occasions . You sound like an old pro. Hanging is a great way to dry flowers too. It gives them a great air circulation for even drying. I sometimes use hairspray too but not always and have even tried a little spray poly on a wreath or too. I found your page the other day while just surfing the web. I can hardly wait to “dig” into it. Thank you for the great ideas I see on your site. I know I will be spending a lot of time learning from you and your followers. So glad to have you. I’m sure you have a lot of wisdom. Please feel free to share with us all. Do you spray your hydrangeas to “fix” them? To be honest I usually don’t, but from time to time I’ve used both hairspray and spray poly to help protest a wreath. Hope that answer helps you. I also remember using dried hydrangeas at Christmas and I used a few a couple of years back. Spraying them gold is a great idea. After all, everything that was old is now new again, right? Fantastic idea. Even though we live in NZ which is hot at Christmas, I may give this a go for church. What sort of berries did you use? We had a bumper crop this year, so I have a ton for The Gray Door Market in September. How wonderful. I bet they will be a huge sale for you at the market. I wish I lived closer because it looks fabulous! Yes. Some of the newer dark hybrids are so beautiful. Just wait until they are starting to dry out a bit before picking. If you have an abundance of blooms you can try some earlier, but your results may be hit or miss.